Here is the post spring football depth chart from GoDuke.com. Daniel Jones is the clear cut top QB on the Duke FB depth chart. 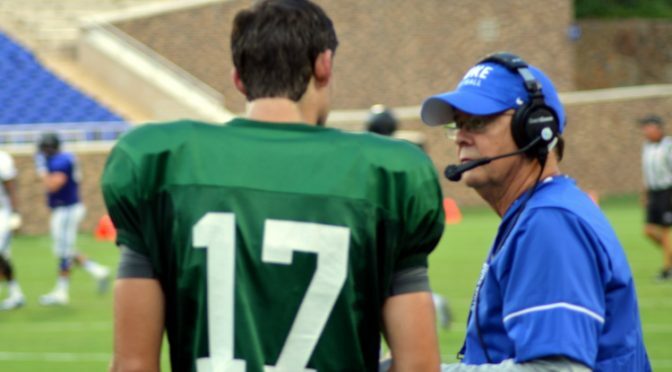 DURHAM, N.C. – Following his team’s 15 spring workouts, head coach David Cutcliffe released an updated Duke football depth chart Thursday. The Blue Devils wrapped up the spring practice period on Friday, April 20, and open the 2018 season Saturday, September 1, at home against Army West Point. Rising redshirt junior quarterback Daniel Jones returns for his third year under center. The Charlotte, N.C., product ended the 2017 season as the Quick Lane Bowl MVP and an ESPN ACC All-Bowl Team selection. One position of exceptional depth for the offense this spring was the tight end group, with four returning letterwinners. Rising redshirt seniors Daniel Helm and Davis Koppenhaver anchor the group with rising sophomore Noah Gray and rising redshirt sophomore Mark Birmingham also experiencing action in 2017. Helm, Koppenhaver and Gray combined for seven scores, forming the only tight end trio in the ACC with multiple receiving touchdowns each. Leading the way for the defense will be returning All-ACC selections Joe Giles-Harris and Mark Gilbert. Giles-Harris, a rising redshirt junior linebacker, was a 2017 All-America selection by the Walter Camp Foundation (second team), CBS Sports (third team) and Phil Steele (third team). Gilbert was the leading vote-getting cornerback in the All-ACC balloting and tied for third nationally with six interceptions.